It takes a lot of effort to rebuild a fallen franchise, but Activision and FreeStyleGames have proven to be more than up for the challenge with Guitar Hero Live, taking a classic series and making it its own. Our review. Taking a property left for dead is among the most daunting tasks in gaming. The last time anyone had seen Activision's Guitar Hero, the series had flown too close to the sun and its wings melted under the intense heat of gimmicks and monster makeup. After a fall of that magnitude, the only thing left was to start all over and build from the ground up. That's what FreeStyleGames has attempted with Guitar Hero Live, taking only the most fundamental elements of the rhythm game series and bringing it forward towards an entirely new game. The result is something that feels vaguely familiar, but also feels novel in a number of new and creative ways. The "newness" of Guitar Hero Live takes hold immediately, throwing players right into a lengthy tutorial before ever seeing a menu. It wastes no time in introducing the new normal: three two-layered frets, instead of the standard five colored buttons. The tutorial is friendly enough to get players started, though it won't deal with many of the more advanced techniques that will get players passed Regular difficulty. Gutiar Hero Live does retain an important element of the series and that's the sense that it is completely possible to get better over time. No one should be an expert out of the gate, but with practice, there should be a sense that progress is being made. That proves to be the case in Guitar Hero Live, as I never got the sense that I couldn't do better or that I couldn't eventually full combo a song with some time and effort. The only grievance here is that the jump from Regular to Advanced seems to be a steep one, with the number of difficult chords increasing more than expected while also throwing in chords that mix up higher and lower frets. There doesn't seem to be happy medium between Regular and Advanced, with the former feeling too easy and the latter feeling like too high a leap. Despite that, the adjustment to three frets isn't as daunting as it looks and it should be easy enough to grasp after a couple of sessions. The other major innovation is the formal end of animated backgrounds. 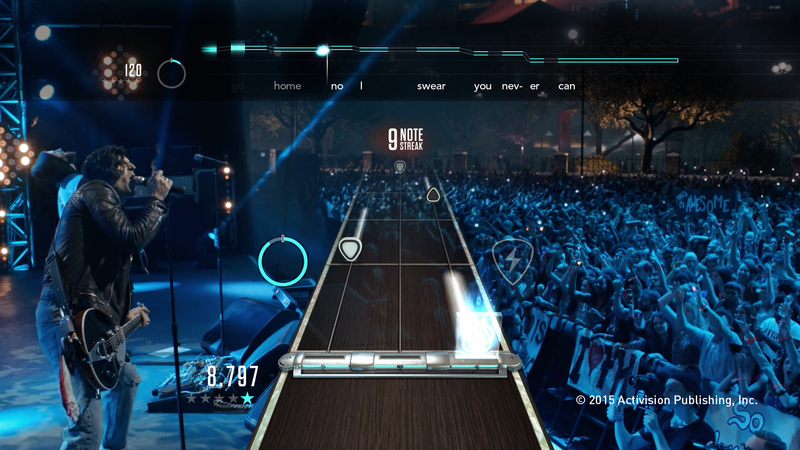 The "Live" element of Guitar Hero Live focuses on live concert footage, meant to evoke a feeling of playing an actual concert. Crowds and band members react accordingly to performance. Poor performance turns the crowd hostile and gets the ire of bandmates, while good performances create a raucous atmosphere. This is where it should be noted that fail states have been removed completely. While the backgrounds will adjust to ineptitude accordingly, players cannot fail songs at any point and instead are trusted to eventually win the crowd back over. This reduces much of the pressure in playing and actually makes the experience feel more relaxing. While I laud FreeStyle's efforts to make the live concert feel an immersive experience, it does start to feel a little hokey at times. Whether it's the fictional bandmates staring you in the "face" and addressing you directly backstage or whether they're shrugging at you over a bad performance, I didn't quite get the first-person sensation that the game was aiming for. If anything, I mostly ignored it all and just focused on the notes, just as I have since day one. 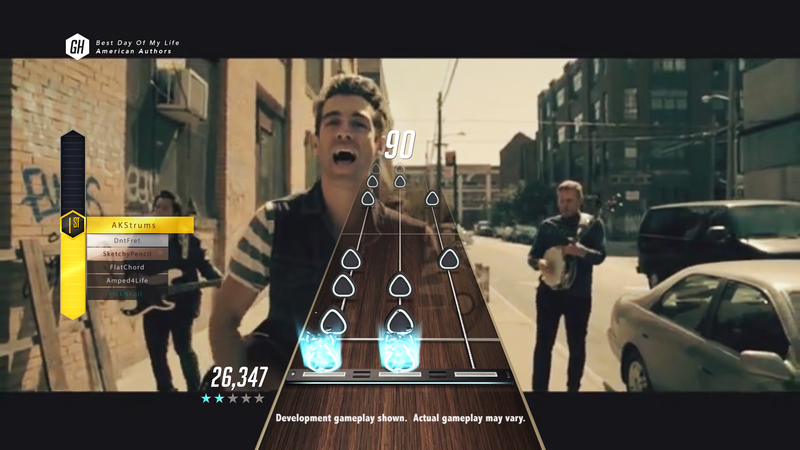 Where Guitar Hero Live particularly stands out is with GHTV, a game mode that focuses on playing along with actual music videos. The mode runs on two (soon to be three) concurrent 24-hour channels with dedicated blocks of programming dedicated to song genres or themes. It's classic MTV as many people will remember it, right down to its simplified transitions in-between songs and programs. GHTV is where Guitar Hero Live really shines, allowing for players to casually jump into songs as they're already playing. There's a high competitive element that shines through here, with asymmetrical multiplayer pitting players against seven other players and their best scores. In terms of gameplay, it's a simple "pick-up-and-play" atmosphere. For music fans, there's high nostalgia value in seeing classic music videos intact and FreeStyleGames picked some of the best, like Weezer's iconic "Buddy Holly" and The White Stripes' "Fell in Love with a Girl." But more than that, with a concurrent channel of curated programs, it allows players to constantly discover new music that they may not have given a second look to before. That's the spirit of what makes these types of games so great and FreeStyle appears to have truly grasped that. The other major change from past games is that FreeStyle is changing up the DLC model significantly. Any of the GHTV tracks can be played on demand for "plays," which are purchased with in-game currency. Theoretically, it's possible to play any new tracks added to Guitar Hero Live without spending a dime. Just spend some time in GHTV and earn enough coins to pick up some plays. This is something of a double-edged sword. On the plus side, it's a relief to not have to worry about blowing extra money on DLC tracks, because as someone that spent the last decade with both Guitar Hero and Rock Band, that became an excessively expensive proposition. On the other hand, it's unfortunate to not have any kind of option to own a track permanently. As someone that looks to perfect my craft, it's a bummer that multiple attempts at a song will cost me multiple plays, causing me to burn through my in-game currency. Even if I dipped into my actual wallet for real money, it can only go towards limited-use plays. If it's gotten to the point that I've got a credit card out, it'd be nice to have an option to own a track for good. Fortunately, in-game currency is plentiful and the rate at which it comes is reasonable. Forget what you know about old Guitar Hero games. Those are in the past. 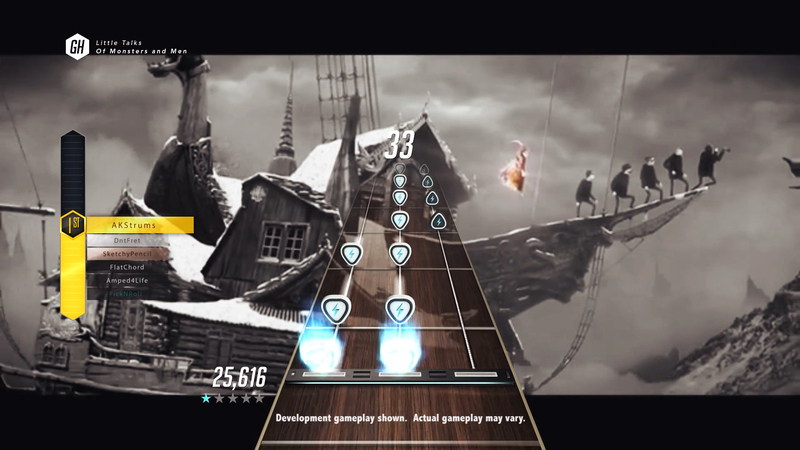 FreeStyleGames has taken only the most fundamental pieces of what Harmonix and Neversoft introduced and instead put their own unique stamp on Guitar Hero Live. In many ways, it's for the better, especially in GHTV. In fact, GHTV might even have some players wondering why that wasn't the whole game. It certainly makes the live action concert element feel superfluous. This review is based on an Xbox One retail copy provided by the publisher. Hardware was also provided by the publisher. Guitar Hero Live is available now on Xbox One, PlayStation 4, Wii U, PlayStation 3, Xbox 360, and iOS mobile devices. The game is rated T.
Interesting model with GHTV. Unfortunately for me, rhythm games are very much a social experience for me, so I'm gonna pass on this one, Activision. GHTV sounds REALLY cool! It scratches a nostalgia itch I have for old school MTV. That mode may have changed this from a "wait for a price drop" to a "pickup for full price" purchase. Would have tried it, but RB 4 left a sour taste in my mouth and wallet.